A fire in a 22-storey commercial building in the Bangladeshi capital Dhaka yesterday killed at least 19 people, injured 70 and trapped many more. Searches went on late into the day as some of the trapped waved frantically from the windows and roof of the building in the Banani area, while others tried to jump to safety. Firefighters perched on cranes smashed windows in an attempt to reach those inside, witnesses said. Officials carried charred bodies out as hundreds of people gathered in the street below. One man fell while trying to escape by coming down a rope, a witness said. By evening there were still some pockets of fire in the building, though it had largely been doused, officials said. 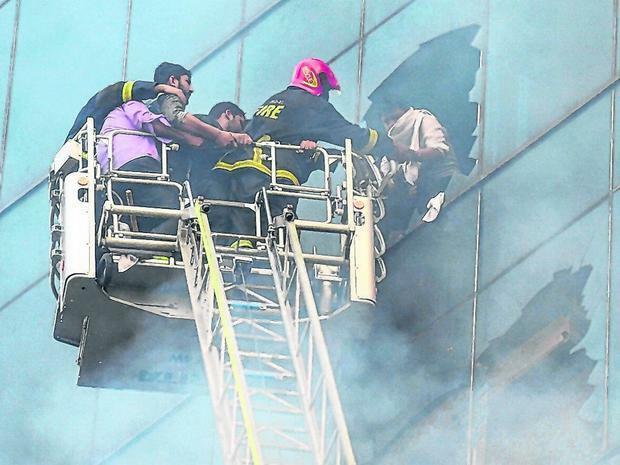 More than 100 people had been rescued from the building with helicopters and ladders, said Julfikar Rahman, director of the Fire Service and Civil Defence. “Our firefighters are searching for bodies on every floor,” Mr Rahman said. A girl sobbing outside the building said her father worked in an office inside but was not answering his phone. “I don’t know where he is,” she said. Critics at the time blamed poor enforcement of safety regulations in one of the world’s most densely packed cities. Helicopters joined 22 firefighting units that worked with the army, navy, air force and police to battle yesterday’s blaze as smoke billowed into the sky.